Cloverdale Transit, Local 68 provides local weekday shuttle service within the City of Cloverdale. Click here for the Local 68 route and bus schedule. 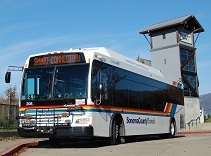 Sonoma County Transit, Route 60 provides daily bus service to and from the City of Cloverdale with connections to the greater Sonoma County area. Click here for the Route 60 route and bus schedule. Amtrak Thruway Service provides bus service to the City of Cloverdale via the Cloverdale Depot, located at Citrus Fair Drive and Asti Road. Click here for the Amtrak Thruway Service schedule. SMART is a passenger train and multi-use pathway project that will provide 70 miles of rail service connecting Sonoma and Marin Counties and serving 14 stations from Cloverdale in Sonoma County to the San Francisco-bound ferry terminal in Larkspur, Marin County. Click here for more information on SMART. The Sonoma County Airport is conveniently located in the heart of the wine country just 30 short minutes south of Cloverdale, and offers convenient access to ground transportation and affordable parking. Click here to book a flight.